I bought this book used from Powell’s Book Store in Portland, it is a bit beat up but I think that is fitting condition for this story. I was lucky enough to meet Rudy Rucker at a DragonCon years ago. At the time I did not know who he was but he was on a panel with William Gibson, Bruce Sterling, and Anton Wilson talking about the future of the future. Out of all the panelist what he had to say the most interesting. Shortly after that panel I made my way through his Software, Wetware, Hardware books, along with a horror story that gave me a week of nightmares. A couple of years later I found a book named “Gnarl!” which is full of short stories that combine fiction, science, and. Several of the stories I had to reread over and over again to feel like I understood them, a few I eventual gave up on ever understanding. I really enjoyed being challenged by those stories; it may have been the first time my mind was stretched in that way by a book of fiction. Good stuff. The easiest way I can describe Hollow Earth is Tom Sawyer meets Edgar Allen Poe in a story written by Jules Vern. At its heart this is an adventure book about a boy in 1800’s America traveling with his boyhood companion who happens to be a family slave beginning in rural Virginia, making their way to Richmond, and then into the center of the Earth and back out the other side. 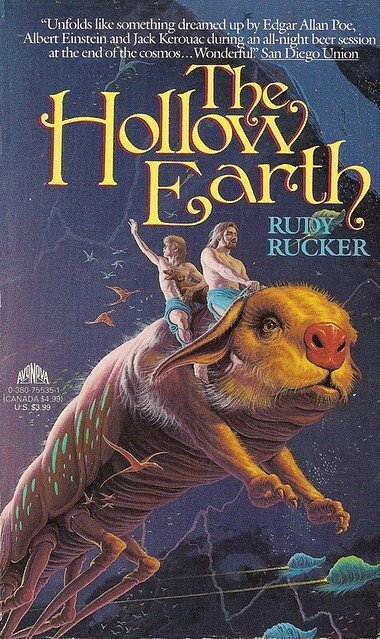 I enjoyed reading this book, but it did not draw me in the way other Rudy Rucker books have. The pacing was slow, the dialog did not always flow, it just didn’t work for me. In 1836, Mason Algiers Reynolds leaves his family’s Virginia farm with his father’s slave, a dog, and a mule. Branded a murderer, he finds sanctuary with his hero, Edgar Allan Poe, and together they embark on an extraordinary expedition to the South Pole, and the entrance to the Hollow Earth. It is there, at the center of the world, where strange physics, strange people, and stranger creatures abound, that their bizarre adventures truly begin. I rate this book a 5 out of 10 and recommend it to any fans of Rudy Rocker, for those unfamiliar with him I recommend reading Gnarl! I put off reading this book for what felt like a long time. I heard a lot of negative things about it from various podcasts and blogs when it first came out and I figured I would read it later. After awhile coworkers were referring to passages of the book and quoting it a lot, so I decided I finally needed to read it. I got it as an audiobook from Audible narrated by Dylan Baker and it took me two weeks to listen to all 25 hours of it. Mister Baker did a great job narrating the book, I really enjoyed his performance. Walter Isaacson had unprecedented access to Steve Jobs, his family, his friends, employees at Apple, and a lot of other people in Steve’s life. I don’t think any author has ever had that kind of access to a person like Jobs. The details in the book are amazing, if you have an interest in the history of Apple and want to know much of its history, then this book is for you. If you are looking for a memoir, I don’t that will ever happen. Steve Jobs just wasn’t that kind of person. Maybe he didn’t have the type of personality that would let him share many of his real emotions. And maybe he just didn’t have the emotions and feelings that many people do. There is so much in this book, I am still processing a lot of it. At the moment my favorite insight from the book is about how Jobs used prototypes and mockups to determine what would work best. It was done with the iPhone, iPad, and even the Apple stores. I hope companies everywhere listen to that, quick prototypes put in front of users and decision makers early and often will save time and money and lead to better products every single time. 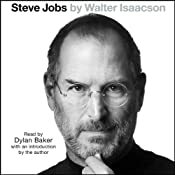 I rate this book a 9 out of 10, anyone interested in biographies, computer history, Apple Computer, or Steve Jobs will absolutely love this book. With the “new iPad”, aka iPad 3 I decided to give digital comic books a try. As a rule, comics and in fact any graphics that have enough resolution look amazing on the iPad 3, type is super crisp, colors are ultra-vibrant, and the detail is incredible. After some research I decided to buy a subscription to the “Marvel Digital Comics Unlimited” which offers over 10,000 comics for an annual fee. Wow, that sounds great. But sadly it does not work on the iPad, in fact it requires Adobe Flash to work on any machine. My next stop was “Comics” by Comixology, who also makes the mobile apps for most of the comic book publishers, which has a very cool feature called “Guided View(tm)” which zooms in and out around the comic to make reading easier. But with the new iPad and its incredibly hi-resolution screen I found all that unnecessary and prefer to view an entire page in portrait mode or “fit” the page width in landscape mode. A great thing about Comixology is all of the free comics offered in their store. For the most part I am able to get enough free comics to satiate my desire to read comics. Even better, free comics have introduced me to some series I had never heard of before. Another great aspect of Comixology is the large number of publishers that are available, they are not just limited to Marvel and DC but have comics from Archaia Entertainment, BOOM! Studios, DC Comics, Dynamite Entertainment, IDW Publishing, Image Comics and Marvel Comics which amounts to a great selection of genres and titles. But Comixology does not make me happy, buying a ton of comics that I plan on reading once and never again doesn’t make sense to me, I do not want to be a collector, just a reader. I would rather rent my comics than buy them. The cost of comics and graphic novels are out of control. It seems to me that they are priced for collectors and not for the masses to enjoy. Using The Walking Dead as an example, issues 1 through 48 are available in a compendium for $60 (currently $35.14 at Amazon), compared to the price of buying individual comics that is a bargain, but for someone like me who just wants to read them and not collect them it is a very steep price. Compared to the price of a novel, movie, or video game and it is outrageous. Hopefully Comixology will have some type of subscription model worked out in the near future. I am really looking forward to it.